Our League of Legends Nexus Blitz guide contains everything you need to know about this new Experimental game mode, including details on the ruleset, map size, event mechanics, rewards, items and more. Riot Games is looking to push League of Legends into avenues unexplored with a brand new initiative entitled "Experimental Modes". While League is home to other game modes like ARAM, Urf and Twisted Treeline on top of its traditional Summoner’s Rift setup, this is their attempt to craft a game mode that isn’t tied to a specific Event. They’re aiming to create a permanent mode that finds its place alongside Summoner’s Rift, which is something that hasn't been done before. We’ll get into Experimental modes further in the section below, but Riot’s first addition to the setup is Nexus Blitz. Unlike Summoner’s Rift, which has games that can last from anywhere between 20 minutes and well over an hour, the plan for Nexus Blitz is for speedier matches that last no longer than 20 minutes. This mode takes place on a smaller map and has players take part in a number of random Events throughout the contest that can reward the winners with powerful buffs. Below, we have everything we know about this new League of Legends Nexus Blitz mode. You can find a general overview of how Nexus Blitz plays, the unique Events and Rewards that crop up in it, plus all of the unique and returning Nexus Blitz items. Additionally, we have some more general info about Riot’s Experimental Modes. Here’s a round-up of everything we know about Nexus Blitz that should give you a base understanding of the game mode. You can find even more specific details over to the official League of Legends blog. Nexus Blitz is a 5-versus-5 game mode that tasks each team with destroying their opponent’s Nexus. However, unlike Summoner’s Rift, it is intended to be a fast-paced mode with matches that should last around 15-20 minutes. The map is more compact, with each team consisting of duo jungle in close proximity to three laners. Events are a brand new mechanic exclusive to this mode. These “mayhem inducing” scenarios begin every few minutes and are very similar to objectives from Heroes of the Storm, world events in MMORPGs or Public Events in Destiny. Examples include sudden King of the Hill moments, attacking or defending a Payload and even the closing circle of death from Battle Royale games. We’ve broken down all the Events you can see in Nexus Blitz further down the page. You’ll want to participate in these as if your team wins an Event you’ll be rewarded with a special buff. We’re talking huge shields for every team member, arming your minions and turrets with Blitzcrank hooks or installing a base cannon that launches you and your teammates to the centre of the map! We’ve detailed all of these potential rewards later in the guide too. Champions can also go ‘On Fire’ in Nexus Blitz. If you score multiple takedowns without dying to achieve a killstreak you’ll be granted a number of bonus effects until your next death. These include big boosts to your attack speed, adaptive force, mana or energy regen and cooldown reduction. Going on a hotstreak includes some downsides, however, as you’ll also take 25% more damage from opposing champions and start racking up a significant bounty on your head of at least 800 bonus gold to your eventual killer and at least 200 gold to their allies. Elsewhere, all players receive a bonus to their summoner spell cooldown reduction, mana regen and magic resistance on account of the more regular team-fighting that occurs. A great deal more passive gold is given out to your team to regardless of whether they were nearby to last hit minions and monsters. Other balance changes have also been applied to champion abilities, stats and runes. Again, these decisions were made to match the expected pace of the game. Nexus Blitz features a two-lane map that has each team’s Nexus and a single inhibitor at opposing ends. There is a large jungle section at the top and a small section near the bottom. Lane players will split off to the mid and bottom lanes where they’ll find a single turret for themselves and their opponent. To help with rotations, a small series of pathways connect these lanes through the bottom jungle. As for the areas of the jungle, the larger section in the top of the map contains multiple camps and buffs for the jungler duo to defeat. A single Wolves, Raptors, and Gromp camp are placed on either side with an invulnerable turret placed between them to discourage the opposing team from invading. 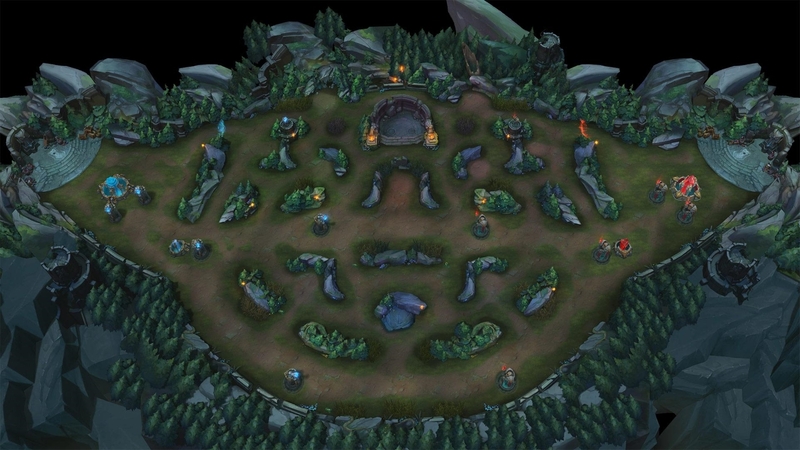 The neutral territory in the middle features a Red buff connected to the mid lane and a Rift Herald slight above it. The bottom section of the jungle is much smaller, containing a Gromp camp on each team’s side. There is also a Blue buff slightly above the bot lane and a Rift Scuttler that loops in a circle around Blue buff. Nexus Blitz features the unique mechanic of having two junglers on each team. When you pick this role in champion select the game forces you to take Smite and does a lot to encourage you to stick with your jungle partner throughout the game. For example, monsters in the jungle grant more gold and experience when killed with another ally and last-hit rewards are split. Similarly, Red and Blue buff are awarded to two champions when defeated, so there’s no need to try and Smite-steal it from each other! As a jungler duo, then, you’re encouraged to spend most of your time clearing out camps and then rotate into lanes to set up ganks with your other allies. You’ll also want to pay attention to when the Rift Herald spawns at 10 minutes into the game. Not only will you get the Herald’s Eye item for defeating him, but your entire team will also be granted a less-powerful version of the Hand of Baron buff. Every few minutes during Nexus Blitz a random Event will occur that all ten players will need to participate in. You’ll know what the first Event will be while you’re on the champion select screen, then others will be announced with a 30-second warning so you can prepare for them. These Events are absolutely worth doing as your whole team can get some powerful rewards if you emerge as the victors. We have more on the Nexus Blitz Event Rewards later on in this guide. Bardle Royale – Yep, the Battle Royale crazy has reached League of Legends. In this Event, an ever-decreasing circle will surround a small portion of the map. Players will have to fight to survive as the battlefield shrinks until there is only one player standing. Bardle Royale (Juggernaut) – This is the same principle as Bardle Royale but in this variant, one player on each team is granted a large health boost and the On-Fire buff. Bardle Royale (Paranoia) – Another variation on the standard Bardle Royale Event. In this one, your vision is massively reduced to just the immediate space around you so it’ll be difficult to spot both enemies and allies. URF Deathmatch – In this Event each player is given a load of buffs and three lives. The last team standing wins. Simple as that. Loot Teemo – League of Legend’s little yordle gets turned into a plus-sized pinata for you to chase around the map. Hit him and kill him to earn extra gold. Loot Veigar – Exactly the same principle as the Loot Teemo Event except Veigar decides to fight back with his Dark Matter and Event Horizon abilities, so watch out for them! Push the Cart – Uh oh, is that Overwatch leaking? In this Event, each team dukes it out to push a payload towards the nearest enemy structure to blow it up. Whoever has the most team members standing in the cart’s radius keeps it moving, so fight off your opponents and take control of the payload. Push the Cart (Attack/Defend) – This works similarly to the original version except one team is assigned to attack with the cart while the other must defend. Arena – Each team takes part in a series of 2 v 2 and 1 v 1 duels. Whoever emerges with the most wins claims the reward for their team. King of the Hill – The classic competitive FPS game mode makes its way to League of Legends in this Event. You’ll need to hold an area of the map for a specific amount of time while keeping your opponent out of the zone to claim victory. Scuttle Racing – Teams can interfere in a race between two innocent Scuttle Crabs. Boost and shield your own Crab while trying to slow or injure the opponent’s. Any unconscious crabs will revive after a short time to continue the race, but whichever one crosses the finish line first earns a reward for their team. Sudden Death (Nexus Blitz) – This Event always occurs as the finale if the match reaches the 18-minute mark. Sick of waiting for someone to destroy them, each team’s Nexus becomes a hulking goliath that marches across the battlefield to smack one another. The first team to down the opponent’s Nexus wins the match! For winning a Nexus Blitz Event your whole team earns one of a handful of potential random rewards. These can be buffs and effects that are applied to your individual champions or objects that can be interacted with on the map to provide some unique utility to your team. Catapult of Champions: This places a giant cannon next to your fountain that you can use to fling yourself across the map. Blessing of Blitzcrank: Turrets and Cannon Minions are given Blitzcrank’s Rocket Grab ability. Very handy indeed! Poro King: This gives you a large Poro King creature that pushes through the top lane. It’ll siege enemy structures, scorch opposing champions with burning flames and heal any allies standing nearby over time. Definitely worth pushing with if you receive him! Battle Sled: Allows one team member to drive while others ride shotgun. You can zip across the map in this until you hit something. When you do collide with an object the sled will explode, damaging and knocking up nearby enemies. Guardian Angel: Your entire team will receive a free one-time Guardian Angel buff, allowing you to revive on the spot if killed. Statikk Shock: Your entire team gains the effect of Statikk Shiv, allowing you to fire sparks of lightning on auto attacks between enemy champions when charged. BF Shield: Your entire team is granted a significantly large shield that absorbs damage. Mega Cloud Drake: Your team is given a large out-of-combat movement speed bonus. Mega Ocean Drake: Your team is awarded more mana regen. - Team compositions are currently wildly sporadic in Nexus Blitz, so it might be best to play a champion you’re more comfortable with rather than trying to fill the classic line-up of roles while the meta is so chaotic. The first Event is always displayed during the champion select screen so you can best prepare for it. - As for Events during a game, you’re given a 30-second warning before they begin. Use this time to back to heal and buy items or better position yourself for the upcoming Event. - Remember that the turret in your opponent’s side of the top jungle is invincible. You can still go for an invade, but be careful you don’t get caught by it. - If you’re in the mid lane you can help your jungler duo have an easier time on Red buff by pushing your lane towards your opponent’s turret when they go to claim it. You can also help with damage for a bit if you’re nearby, but avoid sticking around too long and stealing the rewards from them accidentally! - During the Bardle Royale Events, you can use displacement attacks to knock, flip or stun opponents outside the circle, killing them immediately. - Although the Loot Teemo and Loot Veigar Events give big gold rewards when killed you’ll want to be involved with them from the start as each hit you land also grants additional gold. - Even if you’ve fallen behind massively during a game, if you can hold out until 18 minutes there’s still a chance you may win during the Sudden Death Event. Win a single team fight here and you’ll be free to wail on the opponent’s Nexus as it scraps with your own in the middle of the map. - If your opponents get the BF Shield reward then be prepared to play passively for a while until you can whittle it away. Taking any fights while they have all that bonus health is sure to go badly for you. - Similarly, if they have the protection from Guardian Angel, try to pick off individual players to remove it from them without committing to a full team fight. - The Battle Sled is a ridiculous vehicle that can get you and your team across the map in no time. Pile in a crash right into your opponents to surprise them with a team fight. - Experimental Modes are described as being gameplay prototypes designed to deliver different kinds of experiences that are distinct from game modes currently in League of Legends. 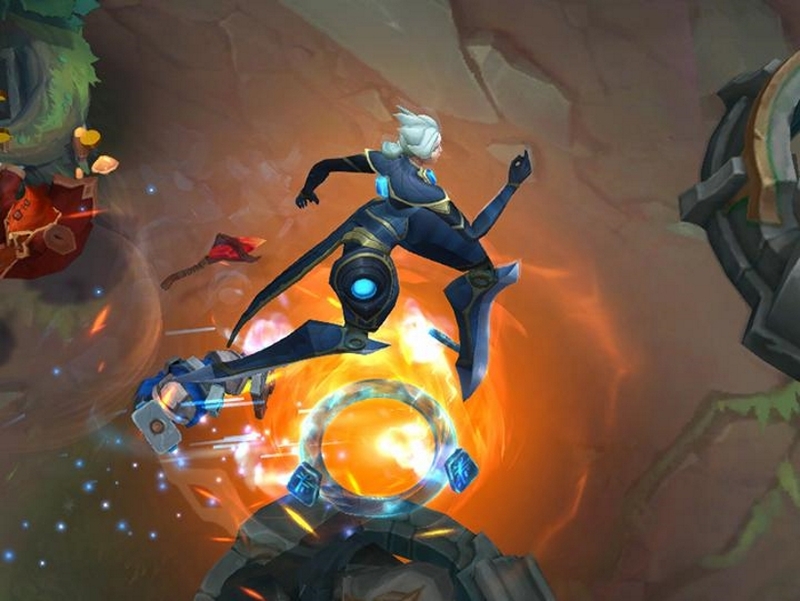 - Unlike ARAM, Urf, Twisted Treeline, Doom Bots and One For All, Riot wants Experimental Modes to be permanent additions in their own right - not just tied to a specific seasonal event. - Experimental modes are works in progress that’ll be introduced in an alpha state so that players can play them and give constructive feedback so the developers can polish things up. - Finally, Experimental Mode releases won’t be happening very often. 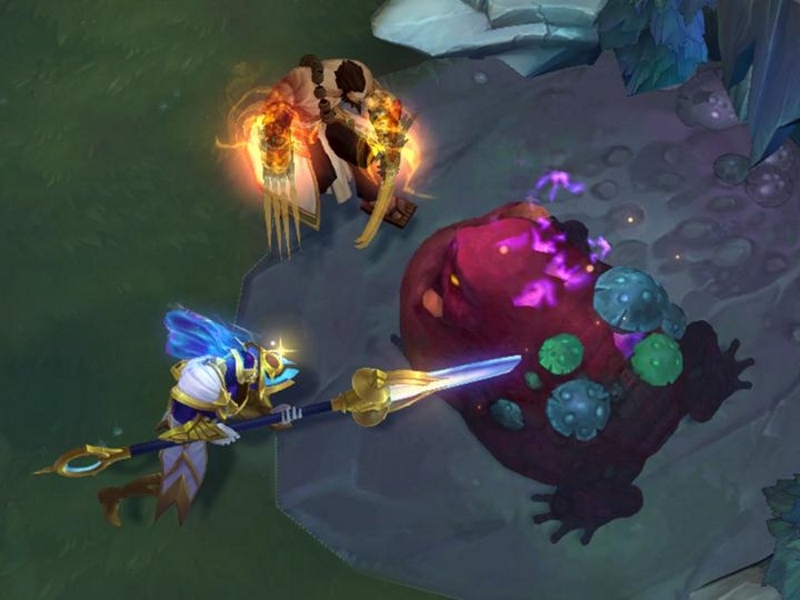 You’re likely to see 2 in a given year, as Riot is busy maintaining and balancing its existing modes and want to make sure that these new Experiments are well designed from the ground up.